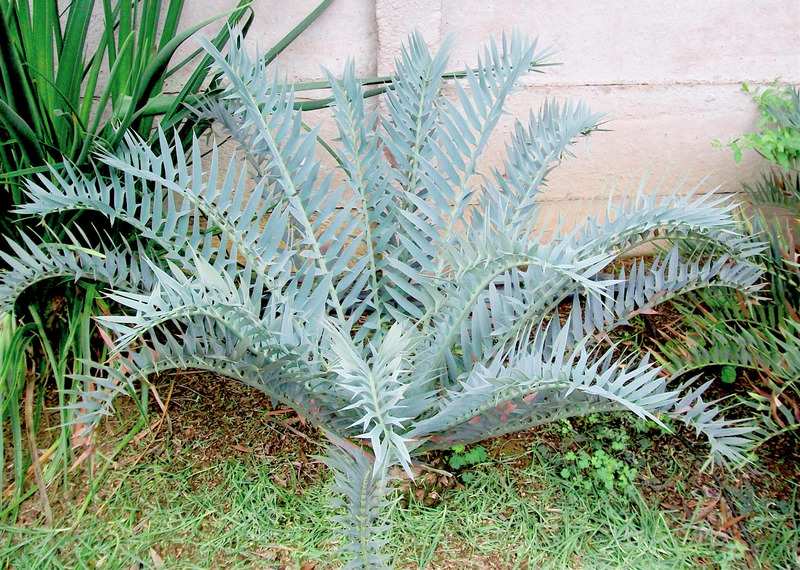 Encephalartos trispinosus, also known as the Bushman's River Cycad is among the most famous South Africa blue cycads Encephalartos trispinosus is a small-to-medium-sized cycad, growing to 3+ feet in trunk height, often clumping with up to 6 stems. Its blue-green, pointy, erect leaves are quite stunning in a garden or pot. Encephalartos trispinosus prefers a sunny location in very well drained soil. It is frost tolerant. Please click here to see a larger detailed image of this plant. Encephalartos trispinosus grows in open rocky areas, or light forest, near Bushman’s River, and Fish River of the Eastern Cape Province, South Africa. Encephalartos trispinosus was originally thought to be a variety of Encephalartos horridus, Encephalartos horridus var. trispinosus, until it was elevated to species status by Dyer in 1965. Encephalartos trispinosus differs from Encephalartos horridus in its narrower leaflets, which are transversely concave, compared to those of Encephalartos horridus, which are convex and wider. Also Encephalartos trispinosus cones are a distinct blue-green color, later becoming yellowish green.